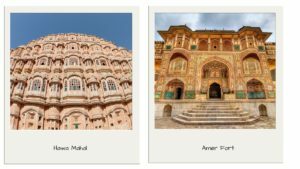 Jaipur is a world-class destination that is known for its rich regal cuisine, unrivaled architecture and natural beauty. This city is also known as ‘Pink City’ after many of the old buildings that are colored in pink, which enhances the beauty of the city, giving it a fairytale-like charm. Jaipur is the capital of the state of Rajasthan in India. It was founded in 1727 by Maharaj Jai Singh II, who ruled the state from 1699-1744. His initial capital was Amber which is 11 km away from Jaipur. 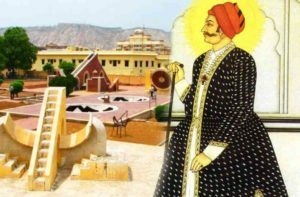 Later, he shifted his capital from Amber to Jaipur due to the growing population and scarcity of water. Jaipur also happens to be the first planned city in India. Jai Singh took a great interest and consulted several books on architecture while planning the layout of Jaipur. A Brahmin scholar of Bengal named Vidyadhar Bhattacharya also helped him to design the layout of the city. In 1876, the Prince of Wales and Queen Victoria visited Jaipur on a tour. As pink is associated with hospitality, Maharaja Ram Singh painted the whole city in pink to welcome the royal guests. It was then that Lord Albert, Prince of Wales, christened Jaipur as the ‘Pink City’. It has a collection of architectural sites that no other city can compete with. Popular attractions like Hawa Mahal, City Palace, Jantar Mantar, Ishwar Lat and much more, make this city more enchanting and memorable. Hawa Mahal is a pink shaded palace that stands in the old city of Jaipur. It is a five storied building which has 152 windows. Another famous site is the City Palace that is located behind the Hawa Mahal. Closeby is Jantar Mantar, a complex of astronomical monuments, and is home to the world’s largest stone sundial. Amber Fort is the city’s pride. It is one of the few hill forts in India that have been preserved beautifully. Maharaja Ram Singh built this fort which includes beautiful palaces within its fortified walls such as the Diwan-I-Aam, Diwan-I-Khaas and the Zenana Mahal.The fort is a stunning example of Rajput and Mughal architectural features. 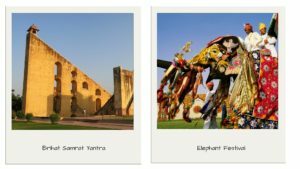 Jaipur is also famous for its vibrant festivals like the Elephant festival, Kite festival, and the Jaipur Literature Festival. People celebrate the elephant festival on the eve of Holi. On this day, locals indulge in sports like elephant polo and elephant tug of war. People celebrate kite festival and Jaipur literature festival in the month of January. The Literature festival has gained lots of reputation as the single largest free literary festival in South Asia. When these festivals burst into the streets of Jaipur, everything comes to a halt and the city transforms into its original character. This city is also famous for its scientific stone sundial “Jantar Mantar”. It measures the exact hour at continuously and defines the calendar precisely. Another aim was to apply the cosmological vision deriving from the Ptolemaic one based upon astronomical facts to astrological prediction both social and individual. Jaipur is also famous for its food. 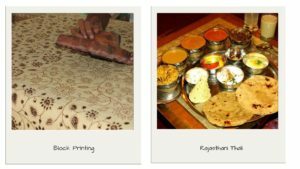 Local restaurants serve traditional Rajasthani cuisine. Their typical dishes are Dal Bati Churma, Missi ki roti, Gatte ki sabji, and much more. This is a destination for people who have a sweet tooth, and some of the local favorites include mawa (a spicy flour snack dipped in sugar syrup) and ghevar (a buttery disc-shaped batter cake, deep fried and covered in pistachios and cardamom). You can also experience a royal cinematic experience at the Raj Mandir, Jaipur’s most famed theatre. In terms of shopping, Jaipur has lots to offer and you can shop at the many bazaars that fill the city like Bapu Bazaar, Johari Bazaar and Tripolia Bazaar where you can shop for handicraft items, jewelry, linen, clothing and much more. This city is also famous for its block printing art. Jaipur offers travelers a regal experience! Join EdTerra as we explore the princely state that showcases India’s rich heritage and culture like no other city in India, and get a glimpse into the Rajput rule that has its imprints all over the city! EdTerra Edventures conducts various international and domestic programs for the youth. If you go to school and are under 17 years of age, ask your school to contact us to arrange a visit to your school for an introduction to the “Jaipur: Make An Impression” program and other journeys under EdTerra’s Indian Discovery Programs.